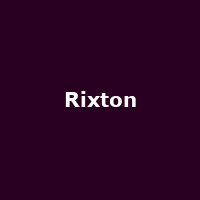 Rixton are an an English Pop/ R&B band from Manchester, founded in 2012. They are fronted by former Emmerdale actor Jake Roche on vocals and guitar, also featuring Charley Bagnall - guitar/ backing vocals, Danny Wilkin - bass/ keyboards/ backing vocals and Lewi Morgan - drums. Their debut release was the 2014 EP "Me and My Broken Heart".